“The new search program for the CSzG which will be invaluable in our post- CRS era. The new Ferret F2 will integrate the CRS with our own elderly Ferret’s records of library holdings. will be possible to teach the critter that specific issues of a journal are missing from a library’s holdings, and thus prevent false positives in library specific search lists. While I could often remember many of the anomalies and realize that a trip to the British Library would be futile given how many errors the “old” Ferret had generated, my memory was rarely perfect. It is obvious that this improvement in accuracy will limit my frustration and trial searching expense. 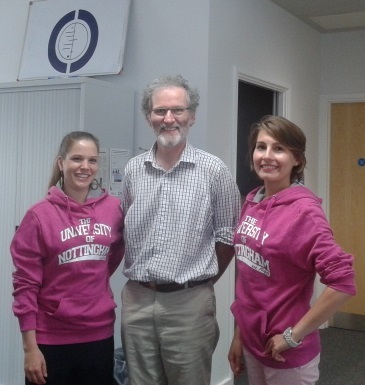 There is also a new level of automation with cross referencing by both cities and journals. 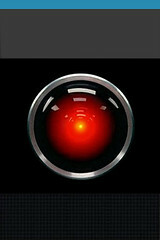 A program called ‘RevMan HAL’ (yes, as in 2001: A Space Odyssey (1968) “”hello Dave”…we have a Co-Ed with a sense of humour) was created. Its purpose: To automatically generate accurate text (a first draft) for the “Effects of intervention” section of a review using data saved in the review by the review team in RevMan. Now, I saw a demonstration of this and it was actually amazing. There were a few buttons to press which will take some getting used to but the amount of text and the level of accuracy it adhered to was amazing. Amazing still to think that this is stuff review authors have been made to write each time and often make mistakes in as it’s quite a boring regurgitating kind-of laborious task. As a side-line it also helps us at the Editorial Base correct those common editorial mistakes such as ‘teh’ (‘the’), lower-case at the beginning of sentences and random spacing around punctuation; kind of like Find and Replace in Microsoft Word. For people like me who commonly make such mistakes, programs and people that can ‘clean up after me’, as my mum and partner would say, are the unappreciated but highly necessary pieces in the review game. In addition to this genius it also has some additional functionality that helps with copy editing. I can’t wait until the copy editors get an eye full of this. What does Steph Sampson, our in-house full-time systematic reviewer think of the program? “All Cochrane multi-review authors know the feeling; you’ve got your nicely-extracted data into nicely-formatted forest plot graphs, ready for a nice result-writing session. This feeling starts with enthusiasm, seeing as you’re ‘almost there’ in completing your review – however, things are only getting started. Repetition, double-triple-checking and uncertainty are afoot; and for reviews with more than 50 included studies, multiple-comparisons and outcomes with loads of data can serve to prolong the writing-up process with complexity. At the click of a button, HAL identifies all comparisons, outcomes and included studies within your review, and automatically constructs your written results section. This includes your risk ratios/ odds ratios/ mean differences, confidence intervals and other meta-analysed data – formatted-and-all, it also takes into account other important factors such as heterogeneity and whether the results are statistically significant, picking-up on P= value numbers. This software is not only well-received news for systematic review authors, but on the grander-scale of things, the software has the potential to re-sculpt the way in which reviews are processed and received. Cutting-down writing time will excel the amount of reviews written, allowing authors to preserve energy for interpreting the data instead of getting lost in how it is to be presented in RevMan. Both of these programs were shown to the top dog of Cochrane, David Tovey, Editor in Chief at The Cochrane Library, and other influential members: Toby Lasserson, Senior Editor at The Cochrane Library; Chris Mavergames, Web Development Director for the Cochrane Collaboration; and, Jacob Riis. They were shocked at the progress made by two techie students in such a short space of time. This could be revolutionary in the review writing world (it could also be the beginning of Terminator, but we won’t go there). With a few more developments and a lengthy sign-off process commonly associated with the public and third sector we could have initiated change in the speed at which reviews are produced and the accuracy of the information recorded from included studies. Watch this space. 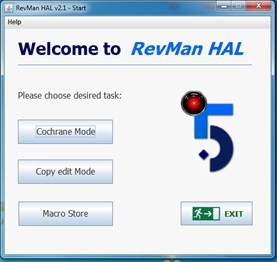 If you use RevMan (which is free to download from the IMS Cochrane website by the way) you should definitely also download RevMan HAL (also free to download from our website) along with the guidance of how to use it.